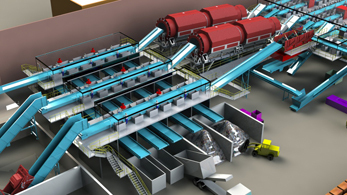 Material Recovery FacilityMaterial Recovery Facility - Material recovery systems and facilities are essential for sorting waste and other recyclable materials for your business. Construction & Demolition RecyclingConstruction & Demolition Recycling - Construction and demolition (C&D) recycling involves using automated sorting systems to organize the construction waste at your job site. Municipal Solid Waste RecyclingMunicipal Solid Waste Recycling - MSW recycling or municipal solid waste recycling is an effective way to manage garbage and other waste from business operations. Waste to EnergyWaste to Energy - Waste to energy equipment will properly recycle a facilities waste and convert it into usable energy in order to eliminate unwanted wastes. eWaste RecyclingeWaste Recycling - Waste recycling & using e-Waste recycling equipment allows companies to manage paper and other forms of e-Waste effectively. Single Stream RecyclingSingle Stream Recycling - Single stream recycling equipment has the ability to sort a combination of recyclable materials simultaneously. Recycling EquipmentRecycling Equipment - Recycling equipment for MSW, C&D waste, e-Waste, and waste to energy conversion provide businesses with a way to effectively manage waste. Recycling Sorting SystemsRecycling Sorting Systems - Recycling systems such as MRFs, transfer station recycling, and other recycling systems benefit businesses looking to organize waste. Recycling Sorting EquipmentRecycling Sorting Equipment - Recycling sorting equipment such as trommel screens, bag openers, & other recycling machines for glass, paper, plastic, waste, & more to benefit your facility. Optical Sorting EquipmentOptical Sorting Equipment - Optical sorting equipment for plastic, e-Waste, glass, paper, metal, and construction and demolition waste for your business. ConveyorsConveyors - Conveyors allow your company to increase productivity through making processes more efficient. Reduce overhead with belt conveyors in your facility. Customer SupportCustomer Support - Our material recovery facilities are backed by the best service in the industry. Customer ServiceCustomer Service - Customer support by Krause Manufacturing will benefit your facility by providing assistance related to your recycling equipment and MRFs. PartsParts - Krause Manufacturing provides parts used in the production of recycling equipment, such as recycling sorting systems, and various MRFs for your facility. TrainingTraining - Training providing by Krause Manufacturing ensures facilities are properly using recycling equipment and sorting solution in their processes. Project ManagementProject Management - Project management services provided by Krause Manufacturing will benefit your business by making recycling processes more efficient for all materials. CompanyCompany - Krause manufactures recycling equipment, recycling sorting equipment, and MSW recycling solutions for facilities focused on construction and demolition. CP GroupCP Group - Krause Manufacturing is a division of the CP Group and is focused on providing material recovery facilities and recycling equipment for construction and demolition needs. HistoryHistory - Krause has been manufacturing material recovery facilities, recycling equipment, and other solutions to benefit the recycling industry for decades. Vision & MissionVision & Mission - Krause has a vision and mission committed to providing the best material recovery facilities and equipment for the recycling industry. MRF LocationsMRF Locations - Material recovery facilities provided by Krause Manufacturing are in a variety of locations throughout the United States. Client TestimonialsClient Testimonials - Testimonials about construction and demolition recycling, MSW recycling, and other recycling equipment support the product offerings of Krause Manufacturing. NewsNews - Press releases keep customers current on product launches, updates, and new developments happening at Krause Manufacturing. TradeshowsTradeshows - Krause Manufacturing attends a variety of tradeshows related to recycling equipment and material recovery facilities to interactive with potential customers. VideosVideos - View various videos of Krause products such as material recovery facilities and other recycling equipment that can be used in facilities. BrochuresBrochures - Brochures about Krause products and services outline photos, specifications, and other detailed information for potential customers. Contact UsContact Us - Contact Krause Manufacturing to receive more information about material recovery facilities and recycling equipment for the recycling industry. We are your single resource for all waste & recycling separation needs, from the tipping floor to baler storage area and everything in between. Downtime is the enemy and Krause offers free support over the phone and on-site technical assistance when needed to keep you up!